The alignment score is a unique dataset to help illustrate how the policymaking process works—looking at the relationships between legislators, lobbying groups, money and votes. To build the dataset, CALmatters partnered with the nonprofit government transparency group Digital Democracy, identifying 20 powerful advocacy groups from all sides of the political spectrum with significant influence in the state Capitol. They’ve logged every time the interest groups take a “yes” or “no” position on a bill, either in the written record of bill analyses or from video testimony, over the past three years. Then we looked at how state lawmakers voted on that bill and calculated scores for each legislator . So if you see a lawmaker with a score of 80 percent with the ACLU, it means that lawmaker voted roughly 80 percent of the time the way the American Civil Liberties Union would want them to (here’s more on the methodology). We’ve combined those scores with campaign contribution records from the National Institute for Money in State Politics for the 2014 and 2016 election cycles. Together, the data allows us to explore questions like: Do legislators vote for bills advocated by groups that give them money? Answer: Yes, but not always. (We’ll be adding the 2018 contributions shortly). What are the flaws in this beautiful thing? How do you treat “abstensions”? 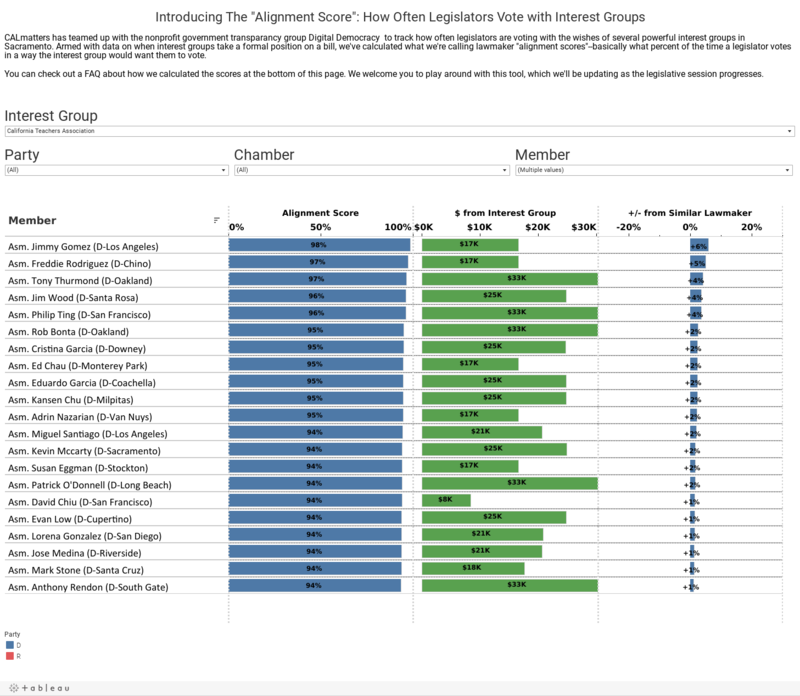 When a legislator does not vote on a bill an interest group takes a position on, we do not include that as a vote for or against a bill (you can play with other methodology options and see how they affect the scores here). If a legislator switches position on a bill—let’s say votes once in committee with an interest group, and once on the floor against it—it is counted as one “aligned” vote and one vote against the interest group. How should I interpret that “+/- from Similar Legislator” thing? We define “similar legislators” as legislators within the same chamber and party that have roughly the same tenure in that chamber. We then take the unweighted average of alignment scores for those legislators to create a single “similar legislator” score. So, a Democratic senator who has been in office since 2014 will be compared to other Democratic senators who have been in office since 2014, but not to Democratic assembly members or Democratic senators first elected in 2016. Why do we do this? Because different chambers vote on different bills, and because the vote tallies include 2015, 2016 and 2017 bills. It’s our crude way of identifying which legislators really buck their party when it comes to certain interest groups. If a legislator is +10% from a similar lawmaker, that means he or she is 10 percentage points more likely to vote with an interest group than similar lawmakers.